Illustrating the vortex dominated flow over the SACCON at an angle of attack of 16 degrees. DDES-SARC turbulence model used. 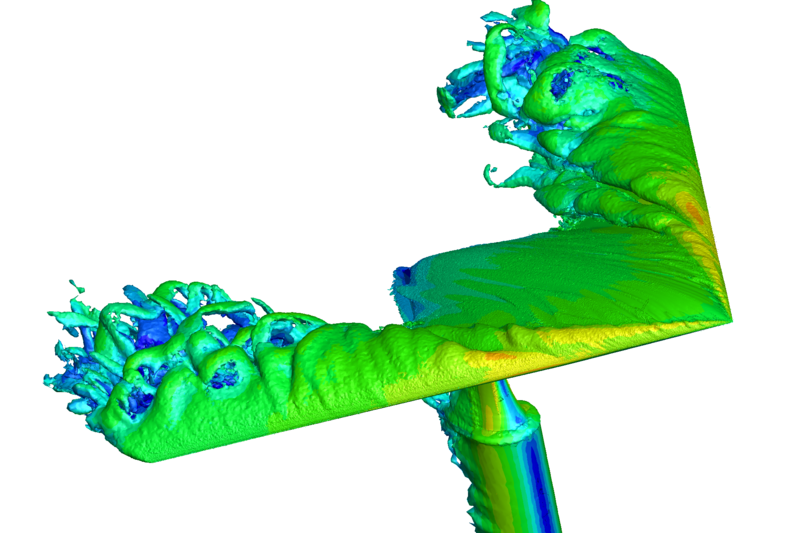 Isosurface of vorticity magnitude shown colored by velocity magnitude. 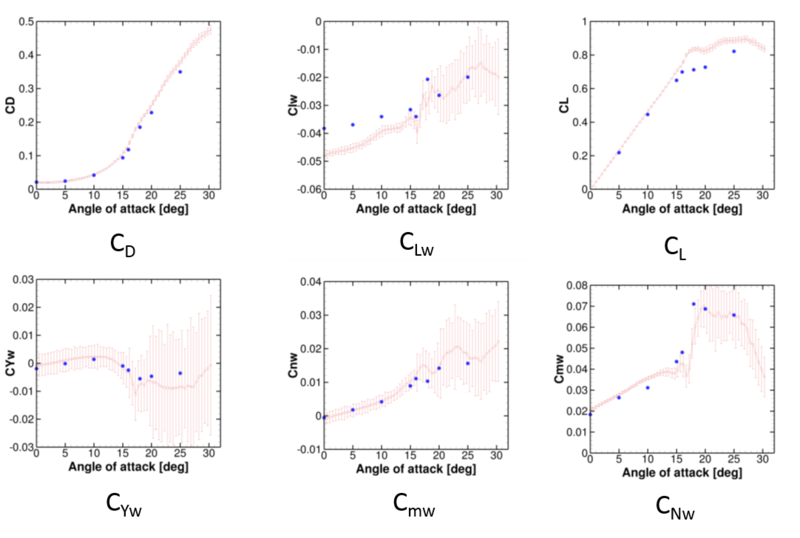 UCAVs present significant nonlinear aerodynamic characteristics with respect to angle of attack, control surface deflections and frequency of motion even at low angles of attack, which makes the task of predicting the aerodynamic characteristics very complicated. 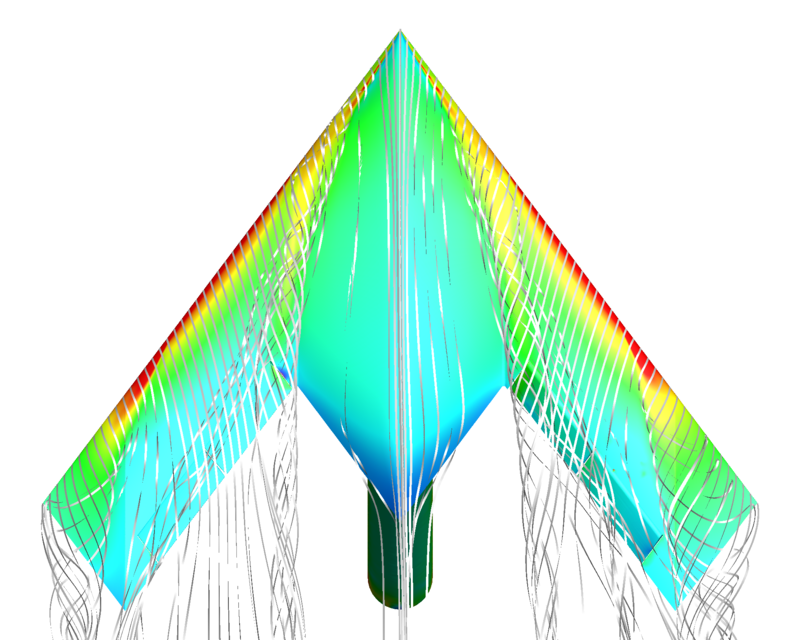 This application focuses on using Cobalt to predict and validate the aerodynamic static and dynamic forces on the Stability and Control Configuration (SACCON) uninhabitated combat air vehicle (UCAV) geometry with the addition of two trailing edge control surfaces on each wing. The work primarily looks at the effects of angle of attack for the control surfaces both undeflected and deflected, and the effects of sideslip and dynamic pitch and yaw motions for the control surfaces undeflected. 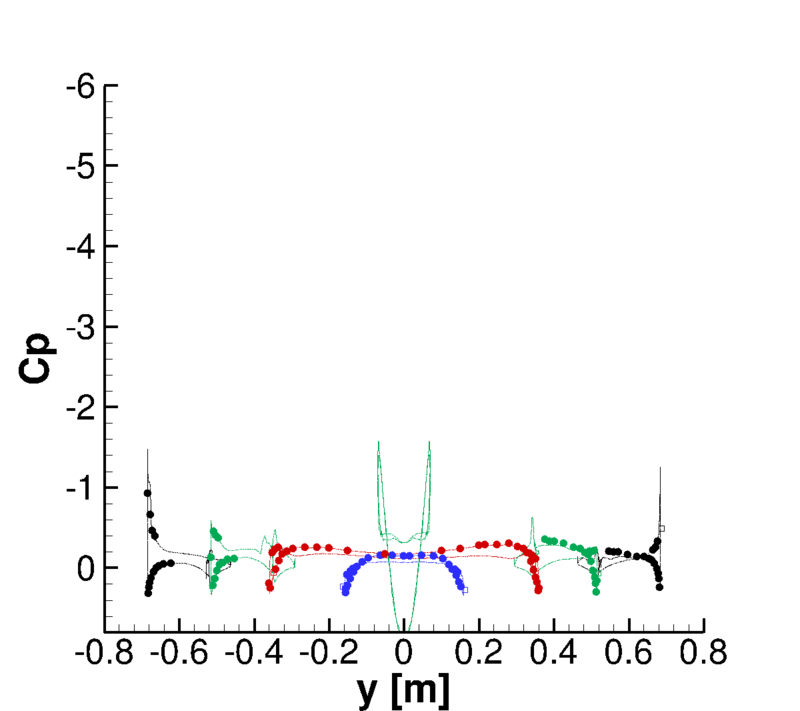 The drag, sideforce and yawing moment coefficients are all close to the experimental data. Interestingly, the pitching moment coefficient is a lot closer to the experimental data than was found for the cases with undeflected control surfaces. This suggests that the flow induced by the deflection of the control surfaces is more dominant than the cause of the discrepancy in pitching moment. 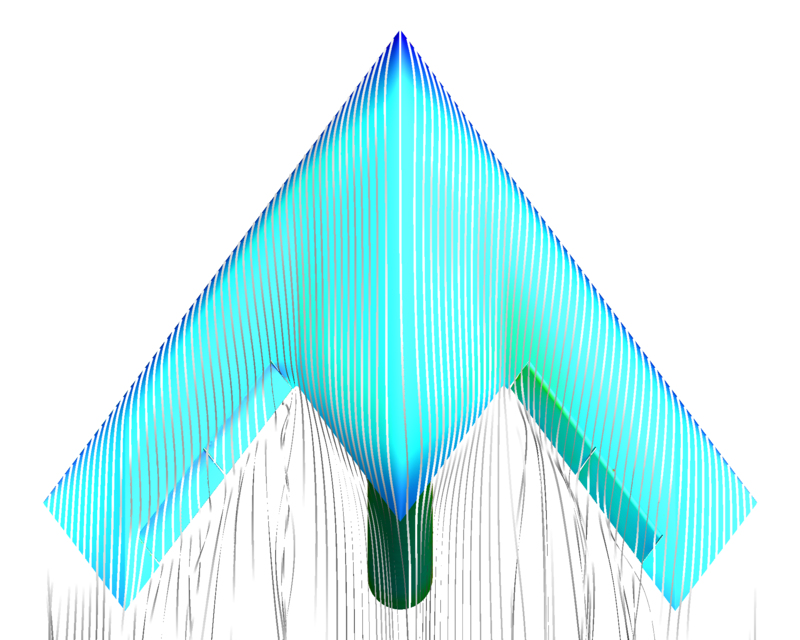 The asymmetry in the pressure field resulting from the control surface deflection appears to be well matched by the computational results. 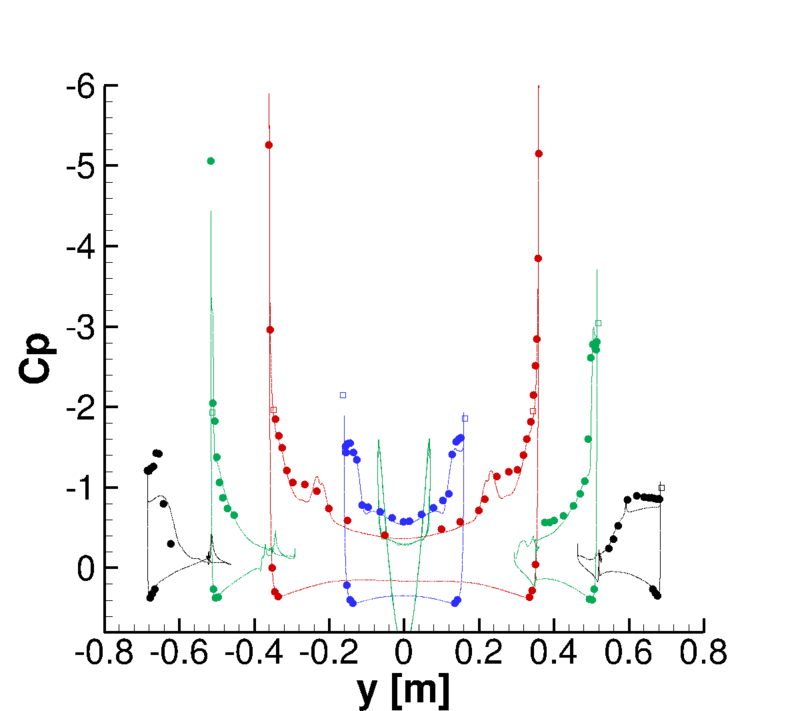 Plots of surface pressure coefficient contours with streamlines and plots comparing the surface pressure coefficient predicted by the CFD with the tapped locations from the experimental data are presented below. 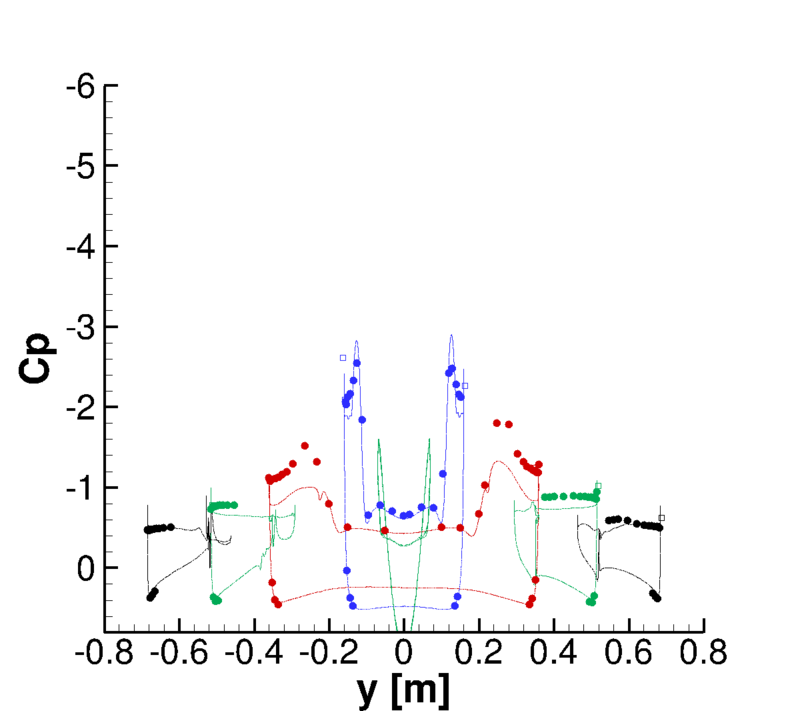 When looking at the plots comparing the pressure coefficients at the tap positions it is difficult to ascertain why there is such a mismatch in rolling moment coefficient. 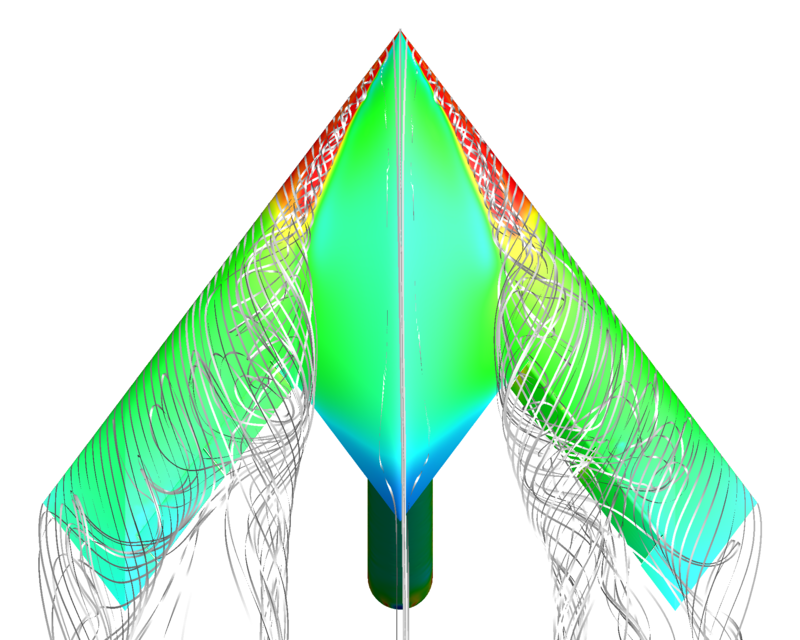 The asymmetry in the pressure field resulting from the control surface deflection appears to be well matched by the computational results. However, there are no pressure taps on the control surfaces themselves, so we do not know if any discrepancies exist on them. This is discussed further below where it is shown the difference between the overset and single grids has a marked effect on the rolling moment coefficient. Finally, the overset grid was compared to single grids with and without control deflections to identify the effect of the geometry changes and chordwise gap introduced by the use of the overset method. It was found that the gap likely does affect the results. There was not a significant effect on the normal force coefficient; however, the pitching moment coefficient at an angle of attack of 10 degrees was around 8% less for the single grid than for the overset grid. There was also a significant difference in rolling moment coefficient between the single and overset grids at an angle of attack of 0 degrees, which is probably attributable to the combined effects of the geometry differences and the gap. Finally, it was also shown that the modifications to the geometry for the overset grid influenced the flowfield in the region of the control surfaces. Overset grid, Alpha = 15 degrees, y = 0:35 m (. Single grid, Alpha = 15 degrees, y = 0:35 m.
Computational resources for this project were provided by the HPC centres at the Engineering Research and Development Center, Vicksburg, Mississippi and at the Air Force Research Laboratory, Wright-Patterson Air Force Base, Ohio through the US Department of Defense’s High Performance Computing Modernization Program. Prediction and comparison of aerodynamic characteristics of MPF prove results of high temperature gas model are close to LAURA code.